So now that the holidays are over we can get back to “normal” at the Dedman’s house! We had a great year in 2012. Looking back at a glance it was a simple year (which is a good thing) we all had good health, great memories were made, and new things learned. 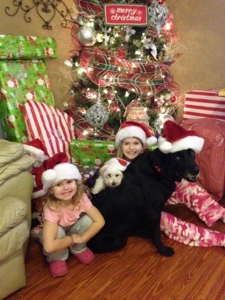 Our family grew with our two dogs Lilly (6 year old black lab) and Moses (4lb Maltese). The girls have loved our addition! Stephen started a new career with Modern Woodmen of America. It has been a great change for him, lots of traveling involved but he loves what he’s doing. He stays very busy with work and at the church, but he always finds time to spend with me & the girls, I thank God for him everyday. 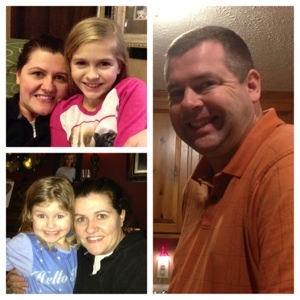 Me & the girls are loving school at home. Great adventures await us every morning. It is amazing to see them both learn new things. Our world has truly become a classroom and we explore it everyday through everything. Learning has become fun and interesting. I am thankful for this opportunity to teach them! We are looking and praying for great things to happen in 2013! More memories and great expectations! !